In 2013, CSISA partnered with the Department of Agriculture (DoA) of Odisha state to introduce mechanical transplanting of rice and community mat nursery production in tribal areas of the state. The pilot’s success has spread enthusiasm in the community for these technologies and could help to alleviate constraints associated with labor availability, labor costs and the costs of rice production. Sabirti Nayak, a tribal farmer from Badjod village, would often face labor shortages during peak manual transplanting time, when she needed additional help planting rice seedlings in her fields. Like other farmers in her village, she was growing rice using the traditional method where seeds are first germinated in a nursery and then rice seedlings are manually transplanted into the fields, a practice that is both labor and cost intensive. 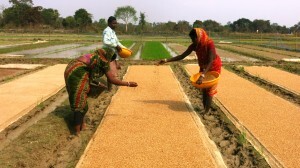 This year, she tried a new way of rice planting with support from CSISA and the Odisha DoA. In collaboration with fellow farmers in her village, she first raised a mat nursery for rice seedlings and transplanted the seedlings into the field using a mechanical rice transplanter. Sabriti said, “I generally suffer from skin problems after working in wet fields for nursery preparation, uprooting the seedlings and transplanting. This new method is good for health and I avoided skin infections in this season.” Sabriti, along with other farmers from her village, attended a meeting on mechanical transplanting in November 2013 with the CSISA team and government extension workers, where she learned about the benefits of this new method over the traditional practice. Mechanical transplanting, as it is popularly known, is new in Odisha’s tribal district of Mayurbhanj, where many farmers still practice traditional methods of growing rice. Last year, CSISA and the Odisha DoA launched an initiative to popularize mechanical transplanting in the district. Following the meeting, 40 farmers from the district, including Sabriti, decided to adopt this technology and attend a CSISA on-site training in January. Since the paddy transplanter machine was not locally available, CSISA supported a progressive farmer, Chinmay Naik, in his purchase of transplanting machine. He now provides transplanting services to his fellow farmers. A mat nursery was planted in an area with assured irrigation and level topography and planting was staggered in order to produce seedlings of different ages. Farmers had initially planned to cultivate a community mat nursery for transplanting onto 40 acres of paddy field, but after seeing the ease of preparation and lower costs, they increased the coverage area to 80 acres. Once mechanical transplanting started, farmers began to see the results. The demand increased as they found that using 15-day old seedlings and wider plant spacing was resulting in good plant growth and increased tillering. Chinmay bought an additional transplanter and was able to service 100 acres, belonging to 120 farmers.